If going to the dentist makes you feel anxious, don’t worry, you’re far from alone! Dr. Burdusi, Dr. Betts, and the entire team at Harbor East Dental help nervous patients every day, and we do everything we can to ensure they have a calm and relaxing dental experience. If you need a little help to feel comfortable in the treatment chair, just let us know, and we can offer a variety of sedation dentistry options that will help you finally take care of teeth without dealing with unnecessary stress. Oral conscious sedation is a method we use to help patients who feel quite a bit of fear when it comes to visiting the dentist. For this, your doctor will prescribe you medication (in pill form) to take the day of your appointment. You’ll be instructed to take it about an hour before you arrive in our office so that by the time you sit in the treatment chair, you’ll be completely physically and mentally relaxed. You’ll still be conscious the entire time, but time will seem to fly by. Many patients say they have little to no memory of their visit afterward, which for some is just perfect! 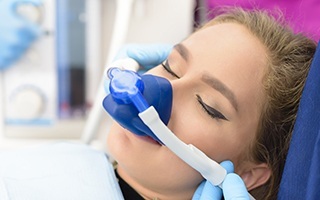 How can Nitrous Oxide Help Me Relax During My Dental Visit? You will find it extremely easy to relax with this form of sleep dentistry. Nitrous oxide gas has an immediate effect after inhalation and some patients report feeling euphoric. We control the depth of sedation by emitting more or less gas, and you will return to normal once the gas has stopped. Going to the dentist doesn’t have to be a source of worry and stress anymore. With our sedation options, we’ll help you glide through your appointment so that the only lasting impression you’ll have will be your gorgeous smile. If you have concerns about visiting the dentist, please let us know, and we’ll be able to help you. 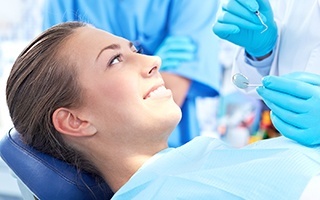 To learn more about sedation dentistry and what it can do for you, please contact us today.